A multi-purpose medium which can be used to thin acrylic paint, increase the open working time, as a sealer, or as a clear varnish or to change the sheen levels of acrylic paints. Sealer: Can be used straight from the bottle as a sizing/sealer on wood, canvas or cotton duck to seal the surface and prevent absorption of paint into the fabric. Thinning: When added to acrylic paints it dilutes the viscosity and blends colours without losing pigment solids and intensity. This increases the open working time and translucency. Use generously with acrylic paint or spread liberally over the surface to be worked on for wet-over-wet or wet over dry techniques. 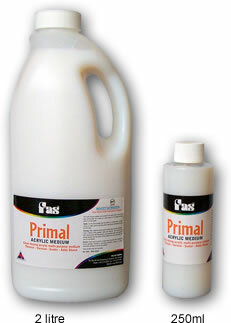 Varnish: Primal can be used as a water based non-toxic over-varnish for acrylic painting. Provides a non-tacky protective coating. It is non-removable, however can be over painted. Clean up with soap and cool water. Available in 250ml, 2 Litre and 4 Litre.